I’m a great believer in signs. I think they are always all around us, guiding us, and giving us the insight and inspiration we need in the moment. A significant sign, to me, is noticing an increase of pennies, nickels and small coins in my path. I’ve learned that one of the most common signs that our deceased loved ones are visiting us is the use of small signs and symbols. About a month after my dear friend Sam passed away, I started seeing coins in my path quite frequently. 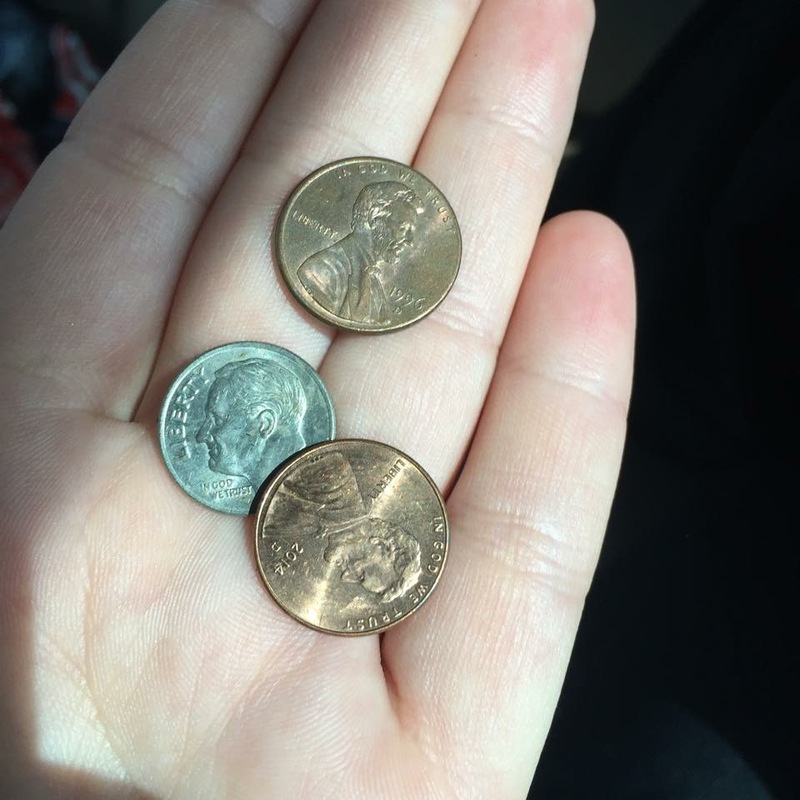 I would find pennies randomly and seemingly out of place. At first, I didn’t think much of it, but when I started finding coins staring straight back at me on a regular basis as I went about my day, I started paying more attention. Like the day I was leaving a photo shoot at a pristine Wall Street building. I was feeling stressed and anxious about a work situation, and was rushing to another appointment. As I was speed walking and working up a sweat in my scarf and heavy winter coat, the shiniest penny I have ever seen was right in front of me on the immaculately kept marble floor. There literally wasn’t even a speck of dirt on the floor, but there in front of me, a penny. Whatever tension I was holding onto was immediately let go. I relaxed. I knew it was all going to be ok.
That same day, on the subway, I looked down, thinking I saw a penny, and it was just old gum stuck to the ground in a circular shape. The very next day, I met my friend Melissa at a Thai restaurant in Jersey City. She was already seated, and waiting for me at the table. I sat down, ordered some food, started talking, and telling her about Sam and all the coins, and how I hadn’t seen any in a while. About a minute later, I looked over to my left, and I was literally sitting next to about 200 coins spread out all over these Buddha statues. I literally laughed out loud and got the chills from head to toe. Sam and his hilarious, very dramatic sense of humor! I could hear him laughing hysterically and saying, “I’ll show you, Kate, I’ll get your attention in a big way!” It was such a beautiful moment with my recently deceased friend. I felt so connected to him, and so silly for ever doubting he is always with me and loves and values me so very much. Whether you have recently lost a loved one or not, finding coins is a major sign that we are highly valued. Please take this to heart, and when you notice a coin that seems out of place, take a moment to take in this important message. I believe when our loved ones cross over, they want to let us know they are doing well, watching over us and sending their love. I also believe they send small signs and symbols by placing something like a penny in our path to point us in the right direction. I continue to find comfort in these “pennies from heaven.” I see the significance of the number 1 as unity and a oneness. To me, it’s a sign that there is unity and Oneness in the afterlife, and also a unity and Oneness between my loved one and me. I feel his spirit move with and through me. I know it also means my deceased loved ones are always visiting, guiding, protecting and loving me while showing me I am valued and never alone. The coins are a gentle reminder to slow down, enjoy the present moment and be thankful. We are all looking for the same thing in life: To love and be loved, feel good, important and worthy, have a purpose, live our passion, be inspired and so on. But what many of us don’t realize is just how powerful we are. How much control we really do have when it comes to living the life of our dreams and showing up big. We think we need more money, to look differently, be a certain age or from a certain family, wait for the “right” person to come along, rack up a million social media followers, have something or be anything else than what and who we are right now. I’m calling BS on that self-limiting story. I’m telling you that whatever you want, you can decide to call it into your life today at this very moment. It only takes two words: I am. Whatever follows these words will find you, and show up in your life, so be very conscious and deliberate about what you attach I am to. For example, if you find yourself constantly saying, “I am so tried, frustrated, confused, broke, lonely, heartbroken, sad, angry.” I don’t need to know you to know what your life looks and feels like. I bet it’s pretty tiring, frustrating, confusing, lacking, lonesome, heartbreaking, sad and upsetting. Am I right? That’s because when you say I am…, you’re inviting in whatever you attach to it. In other words, you are giving it permission to be in your life (good or bad). What if instead you said, “I am so excited, happy, free, healthy, loving, abundant, valuable, smart, kind, attractive, supported and safe.” I can only imagine how much better you would feel and how different your life would look. This isn’t about lying to yourself and saying, “I am in perfect health,” when really you are sick. Today, for example, I am under the weather, but I’m not focusing on that. I keep saying, “I am so lucky to get to spend the day in my robe writing blogs and doing work that I hope inspires others to feel empowered. You get the idea. So while physically I may not be 100%, I still feel really great! And by feeling great, I naturally attract more great things into my life. I can say this with confidence because I am witness to it day in and day out. That’s the powerful thing about the Law of Attraction, it is constantly working whether you believe in it or not. You can choose whether you want to curse or bless your life. Try it out for yourself today. Once you become more conscious of your thoughts, you will begin to see patterns and how you can clean them up, and attract what you actually want into your life. Remember, you are in control and have all the power. When you blame, judge or make excuses, you are giving all of your power away. No Bueno! What do you want to invite into your life today? What or who do you want to let go of? Even just typing this made me happy! Can you feel the joy behind the language, thoughts and feelings? Are you telling me it’s easy to feel like crap all the time?! I think we can all decide to choose again, and lean towards joy and what makes us feel good rather than live in fear and be miserable. Life is meant to be enjoyable! Let’s enjoy it! The best part? The key to enjoying life doesn’t cost a dime. We just have to consciously choose what we attach I am to. I am thankful for all of you. Have a beautiful day!